25 Stories, 11 writers, 1 city. 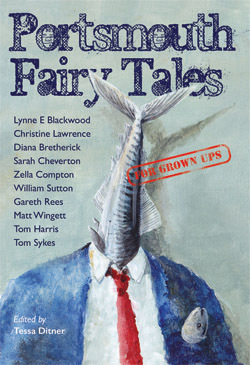 [wp_cart_button name=”Portsmouth Fairy Tales for Grown-Ups” price=”8.99″] £8.99 buyer collects in Portsmouth. This collection of fairy tales for grown-ups contains dark moral tales, historical fiction, sci-fi, comedy, fantasy, crime, memoir and surreal fiction. All the stories have been freshly-written and all are set in and around the UK’s only island city. No chocolate box visions or soppy princesses in sight, the writers have used this magical genre to explore grown-up dilemmas, such as money problems, fear of rivalry in a relationship, floods, memories and changing bodies. Find out why the real Guildhall clock is buried in an underground city to save time. Hear about the man who wished himself onto a ship in a whisky bottle. Discover why a Victorian detective joined forces with the circus to fight Spice Island’s criminals. Embrace your bank statement or the ghost ship will get you. Some stories delve into the city’s rich island geography, others focus on rural Hampshire, its cow pats, mushrooms and breweries. Some have taken their favourite urban location and woven it into fantastical narratives that stretch back to Victorian times, or forward to a dystopian future. Raw, mischievous, dark and yet familiar, these tales showcase a city bubbling with literary minds. Authors: Matthew Wingett, Tessa Ditner, Diana Bretherick, William Sutton, Tom Harris, Tom Sykes, Lynne E Blackwood, Sarah Cheverton, Zella Compton, Gareth Rees, Christine Lawrence. Price: £8.99, plus £2.50 for postage and packing worldwide. Shopping basket will appear in sidebar. Matt – I would like to make contact. I tried tonight but my e-mail was getting through. I need t to speak with your about your book on Father Robert Dolling.